It was all so different, 13 months ago to this very day. Bradford City and Northampton Town were not battling with each other to get promoted out of League Two, but to stay in it. The two sides met at Sixfields with the relegation zone a little too close for comfort for the pair; a Nahki Wells hat trick all but securing City’s survival and leaving the Cobblers with some work to do. They ultimately avoided relegation by four points, not bad considering they were six points from safety when Aidy Boothroyd took over as manager mid-season. If the rise and rise of the Bantams since last season’s relegation close shave has been well documented around these parts, the 13-month progress of Northampton is no less impressive. Were it not for better away form, Town would probably have achieved a top three finish. Write them off at your peril. It has been a brilliant ride for their supporters, as Danny Brothers, editor of the superb Northampton website A Load of Cobblers, explained to Width of a Post, “The last year has seen the Cobblers go through an extraordinary turnaround under Boothroyd, who took over in December 2011 with the briefing of keeping us in League Two. “He promised that things would get worse before they got better but that we would be okay come the end of the season. That we were and then it was all about the summer and a clear out that saw Boothroyd bring in his own group of players to really compete at League Two level. For Bradford-born Boothroyd, who has managed in the Premier League with Watford, this Saturday will be his second play off final as manager and – after beating Leeds 3-0 last time – a second play off final against a West Yorkshire side. At the time of the 2006 Leeds triumph, Boothroyd was regarded as one of the game’s bright young coaches; his stock fell following unsuccessful stints at Colchester and Coventry. One thing has not changed over the last seven years: Boothroyd’s reputation for long-ball football. It is a charge, however, that Danny rejects, “I think there’s a difference between being a ‘long ball’ team and a ‘direct’ team. Pretty much every team in League Two could be labelled a ‘long ball team’ on their day. I find it’s a cop out sometimes used to complain that a team that’s just beaten you is ugly and just plays hoof ball to win. Central to that has been the form of midfielder Ben Tozer – easily Northampton’s stand out player when the Bantams defeated the Cobblers at Valley Parade last month. “Tozer’s long throw has been a lethal weapon all season and he’s played in a variety of positions for us over the last few months,” revealed Danny, who highlighted the contribution of other stand out performers. “Bayo Akinfenwa will always be a threat at this level and we’re hoping that his goal drought going back to February ends at Wembley. He seems to be coming back to his best form just at the right time. “Elsewhere, goalkeeper Lee Nicholls, on loan from Wigan, has had a tremendous season and was man of the match in the second leg of the play offs at Cheltenham. In front of him, Kelvin Langmead has been a rock since taking over the captaincy last summer. Clarke Carlisle joined for a second spell back in December and has been solid again, whilst Joe Widdowson has been consistent at left back. That said, the threat of the Bantams will be taken seriously. Northampton’s recent record against City – and especially Wells – is poor. In consecutive seasons, City have done the double over Saturday’s opponents. 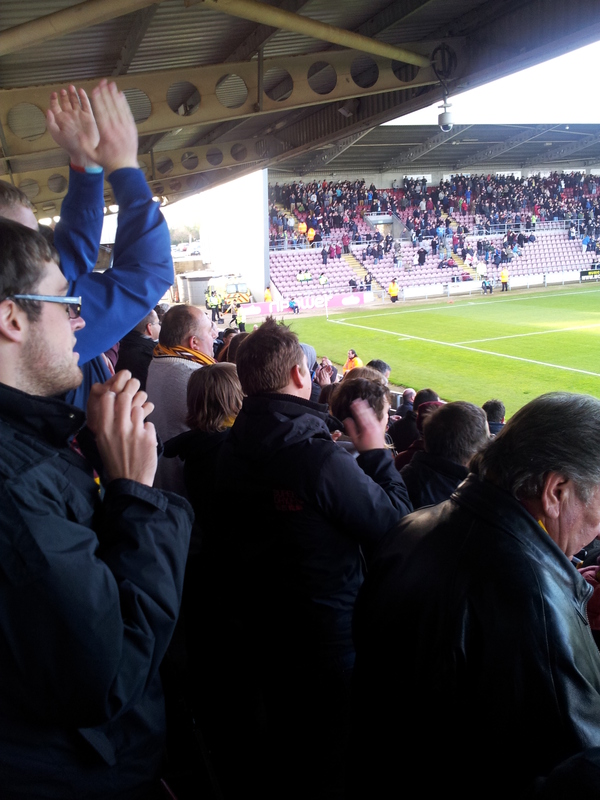 Northampton were also knocked out of the FA Cup in a replay at Valley Parade, last November. “I personally feared facing you in the semi finals so was glad to avoid you, admitted Danny. “We’ve won just once in the last 10 games against Bradford and you always seem to be a tough nut to crack, especially this season with the two cup games and league defeats. Such fears can wait for now, however, as Danny and Northampton enjoy the Wembley buzz. Tickets are reportedly selling quickly for both sides and there is even a suggestion that Northampton – who averaged 4,785 this season – will bring more fans than City. “It’s looking set for a cracking atmosphere with an expectancy that both clubs will bring at least 25,000,” added Danny. “We have fond memories of Wembley with the 1997 play off final win and also of reaching the play off final a year later and coming so close to reaching Division One (the Championship). Special thanks to Danny Brothers for speaking to Width of a Post. Check out his excellent website, A Load of Cobblers, here.